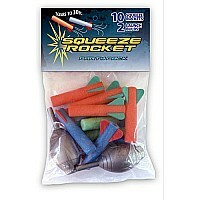 Squeeze Rocket Party Packs are great for parties or just every day fun. Squeeze the bulb to launch the rocket 30' or more! Indoors or outdoors this little rocket is sure to keep the kids entertained.